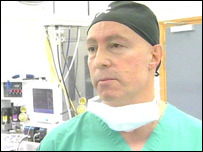 A consultant surgeon believes that waiting lists for operations could be cut dramatically. John Petri, who is an orthopaedic specialist, uses what he calls "dual surgery" at the James Paget Hospital in Gorleston in Norfolk. While he is operating on one patient anaesthetists prepare the next one. "I realised I was wasting a lot of time between operations. Now I do not waste any time and I do not have a waiting list," said Mr Petri. He says the system which focused on use of the surgeon rather than use of the theatre led to a three-fold increase in the number of operations he performed and a subsequent reduction in patient waiting lists. He believes his system could increase the use of surgeons' time by almost 90%. "Previously I was spending most of my time kicking my heels rather than operating which is what I am paid for," said Mr Petri. "We don't really need more staff or even have to throw more money at the problem - we just need to utilise existing assets better." Mr Petri is one of 40 nominees in this year's Medical Futures Innovation Awards to be announced on 3 November. The awards are designed to encourage and promote a culture of creativity, innovation and leadership among healthcare professionals.